I remember when I was a boy, Seventh-day Adventist Churches named their community services centers after Dorcas, and they were called Dorcas buildings. Like Dorcas, community services volunteers demonstrate to the community the love and compassion of Jesus today. Through community services centers we see a practical demonstration of the very essence of Who God is. By feeding the hungry, clothing the naked, and providing practical services for the community, this is the one branch of the church the community would most obviously miss if the church were to disappear. I know we are not saved by works. I realize many a hard worker has died at an early age. Still, I wonder if Dorcas was such a wise steward of her time and blessed so many people in the community, demonstrating the nature of God, that God felt it necessary to extend her life? High priests, apostles, pastors and head elders have never been raised from the dead yet, but God raised a humble community services center worker back to life. That tells me community services workers have a very special place in God’s heart and in my heart too! Thank you to all of you who minister to the community at your local Seventh-day Adventist Community Service Centers! I’ve been told the beatitudes are building blocks to a complete conversion. I find it interesting that after we are filled with God’s righteousness, instead of seeing ourselves as holier than others, we become merciful. Several nights ago, as I was falling into my bed to go to sleep for the night, I heard a loud crash followed up by a boom! boom! boom! thud! I looked out my window expecting to see another fender bender on the little street outside my home. Instead I saw a broken-down fence and upside-down car on the grass. The man inside the car got out okay. Apparently he made the turn from one residential street to another a little too fast. Years before I would have thought to myself, what an idiot! How can you have such an accident on a little street, while making a simple maneuver! However that is not what I thought this time. True, he was going too fast, but over the years I have learned the lesson not to make fun of people who make silly mistakes, because just as sure as I do, I will turn around and do something twice as crazy! Instead of making fun of him, or scolding him, the rest of the bystanders and I just made sure he was okay and had what he needed while we waited for help to arrive. At UPS John, a seminary student, worked with me as a sorter. He was very mild-mannered and never lost it, even in the most stressfull situations. One day our belt was getting overloaded and I asked the unloaders to wait for us to clear the belt before adding any more packages. They did not listen, and more and more packages overloaded the belt. I became angry and said some things I should not have said. I caught myself and told John I felt bad for reacting that way. He assured me that this was a very stressful job, even more so when the unloaders don’t listen to you. He was right, but I marveled that even though he understood and was sympathetic, he still never lost it. He sympathized with me with his words, but he rebuked me like a slap across the face by simply living out a better example! It wasn’t what he said, it was what he did that showed me there was a better way to live. My pastor once suggested that it is best to be “liberal” towards others and “conservative” towards ourselves. Hold yourself to a higher standard while cutting those around you a little slack. Jesus is our perfect example in constantly forgiving all those around Him. Here are some words to live by.Just like Peter, you don’t have to worry about forgiving your friends too many times. No one will ever sin against you more often than you sin against Jesus, and you will never need to forgive anyone as often as Jesus forgives you. I am going to throw in the oldest cliche of all time, just because it fits so perfectly here. “To err is human, to forgive is divine.” To be Christlike we must hold ourselves to a higher standard, while at the same time forgiving those around us. Jesus is the only One who ever lived a perfect life, and while He did so He sympathized with and encouraged sinners. Often He [Jesus] met those who had drifted under Satan’s control, and who had no power to break from his snare. To such a one, discouraged, sick, tempted, and fallen, Jesus would speak words of tenderest pity, words that were needed and could be understood. Others He met who were fighting a hand-to-hand battle with the adversary of souls. These He encouraged to persevere, assuring them that they would win; for angels of God were on their side, and would give them the victory. Those whom He thus helped were convinced that here was One in whom they could trust with perfect confidence. He would not betray the secrets they poured into His sympathizing ear. –Ellen White, Desire of Ages, Pages 91-92. How ironic that the One who has never sinned would be the most sympathetic and understanding friend a sinner could ever have. Having been given the opportunity by the Plant City Seventh-day Adventist Church, I stepped out in faith, relying upon people being moved by the Holy Spirit to contribute. Amazingly, after a year and a half the contributions are still steadily coming in! I am delighted that so many of you are still faithfully supporting this ministry so that I can focus all my time on actual ministry instead of fundraising. Now, I have been advised by the Plant City SDA church that the monthly contributions are down just a tad. God is still providing, so nobody is in panic mode, but if you are a faithful contributor, and believe God is blessing you for being a contributor, I would ask you to pray and ask God if He would like you to invite others to contribute. Since my last newsletter God has blessed in many ways. Thank you for allowing me a moment to share just a few of those ways. 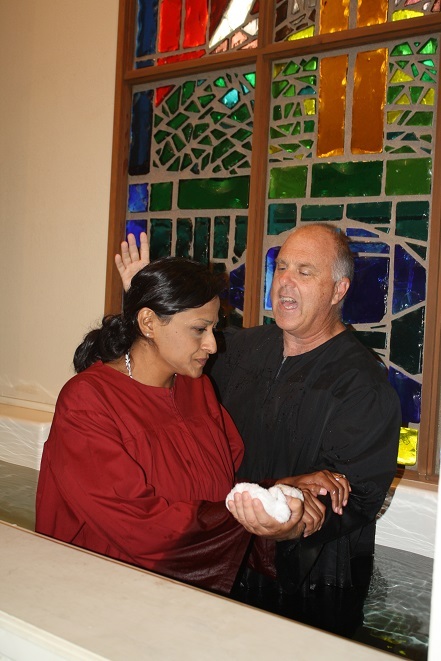 Last June I had my first Baptism at the Plant City Seventh-day Adventist Church. Joyce and her 13 year old daughter Madeline were not attending church, but Madeline wanted to learn more about Jesus, and this touched Joyce’s heart as well. 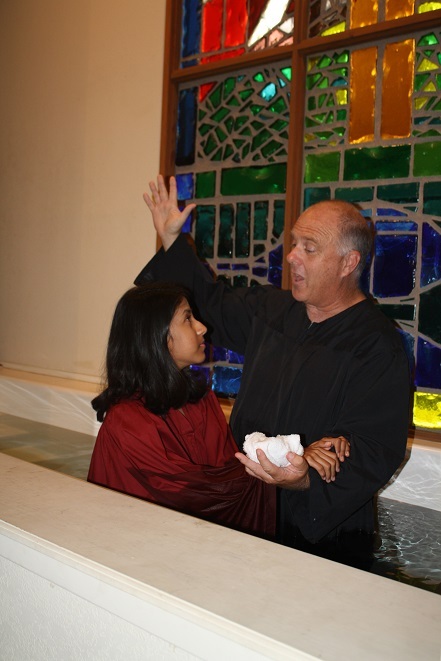 Soon we were studying the Bible together and they both were baptized together. Joyce writes, “I am not perfect. I thought that God couldn’t love someone like me. I was so wrong. Through my bible studies, I learned how God loves me and is there for me. Each time I read the bible, it opens my eyes and heart to a loving and forgiving God.” I am currently teaching a baptism class during Sabbath School time, and Madeline wants to help me in this class. In May and June we had students from Southern Adventist university come to the Tampa Bay area, holding prophecy seminars at Plant City, Tampa and other areas. I was able to attend some of the training and planning meetings to do a little mentoring and even taking some of the student Bible Workers into the community to invite people to the seminars and begin personal Bible studies. The Plant City Seventh-day Adventist Church has fully embraced me as their own and even asked me to serve as head elder for this current term. In the Tampa Bay area, I had personal Bible studies with Hans (Pictured) Cleveland, Paul and Nicson, who were all baptized during the June 2016 prophecy meetings at the Tampa First Seventh-day Adventist Church. In addition to personal Bible studies my group Bible studies continue to grow strong in the Tampa area as well. Last Friday night, my group Bible study had 11 non Adventists, three of which have begun attending the Tampa First church after being in this study group. My other group Bible studies keep me busy as well. My Thursday afternoon teen Bible study group, again made up mostly of teens with no church, has some very faithful members. A few times a teen cannot make it to the study for family reasons or whatever, but they will join on Facetime or Skype. This week Tampa Adventist Academy confirmed with me, my Bible chain referencing schedule for the new school year. This will be the 7th year in a row that I have been teaching the 5th and 6th graders how to chain reference their Bibles and give their own Bible studies to their friends and family. All this in addition to baptism classes and taking my turns with the weekly chapels. As many of you know, my mother passed away in the middle of June. I had several unexpected expenses from last minute airline tickets to funeral costs and so forth. Right before flying out, I prayed and told God that I wanted to stay out of debt, but of course would do whatever my family needed me to do. Right after my prayer, a faithful contributor in Texas saw on Facebook that my mother was dying. She sent me a message telling me that I needed to be with my family and that she was sending a generous gift which helped me with all my expenses! This was truly a sad time for me, but I was very comforted to see God’s loving hand as everything unfolded. Being in Tulsa for my mother’s funeral and caring for my family afterwards, gave me opportunity to continue my Bible Work in Oklahoma. I was able to reach out to former Bible students during my Oklahoma days. Alan, who I began Bible studies with back in the ‘80s and even came to the Owasso Seventh-day Adventist Church when I would preach there, was able to connect with me again, and I connected him with the current Owasso Bible Worker. Alan wants to resume Bible studies after all these years, and will be returning to the Owasso Seventh-day Adventist Church. Twice while visiting my mother while she was sick, I was able to share the gospel at the Broken Arrow Seventh-day Adventist Church. I continue to write for the Sabbath School network, SSNET.ORG as well as my own website Inlightofthecross.com. Both websites are read from around the globe. 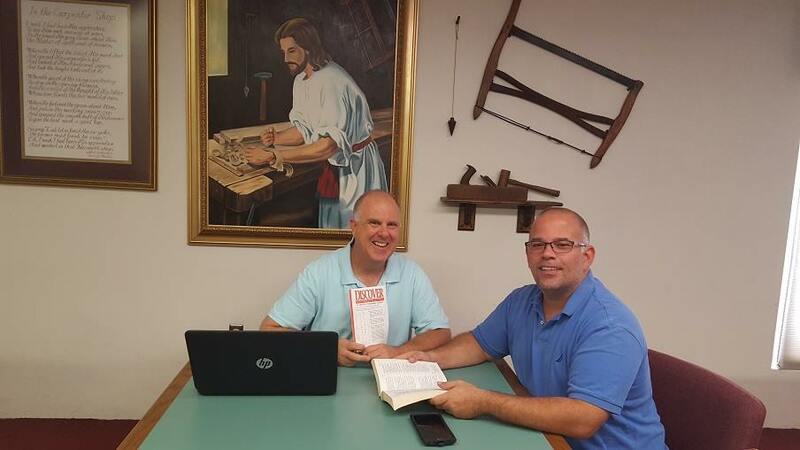 A while back a church in Connecticut contacted me through ssnet.org and had me visit their church in Torrington twice to hold gospel meetings. Recently they told me of their plans to share my sermon on Youtube during the worship service. So you see, even though Plant City SDA church opened up a fund where people can contribute to my ministry from around the world, this ministry also reaches beyond Plant City and goes around the world. It can even reach your neighborhood. All you have to do is give me a call. Thank you again for being such faithful loyal supporters and continuing to support this ministry, and for inviting friends to join you in supporting this ministry. Please follow me on Facebook and at InLightOfTheCross.com. As always your tax deductable donations can go to the Plant City Seventh-day Adventist Church, P.O. Box 5379 Plant City, FL 33563. Please mark your contribution “Bible Worker Fund.” Thank you!